A modified DC-10, the KC-10A entered service in 1981. The KC-10A Extender is an advanced tanker and cargo aircraft designed to provide increased global mobility. The KC-10A can transport up to 75 people and about 170,000 pounds of cargo a distance of about 4,400 miles unrefueled. The KC-10's six fuel tanks can carry more than 356,000 pounds of fuel, almost twice as much as the KC-135 Stratotanker. 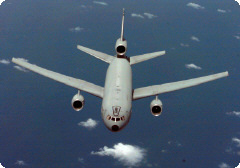 Using either an aerial refueling boom, or a hose and drogue refueling system, the KC-10A can refuel a wide variety of military aircraft within the same mission. The aircraft is outfitted with special lighting for operations at night. The boom operator controls refueling operations through a digital fly-by-wire system. Sitting in the rear of the aircraft, the operator can see the receiver aircraft through a wide window. During boom refueling operations, fuel is transferred to the receiver at a maximum rate of 1,100 gallons per minute and the hose and drogue refueling maximum rate is 470 gallons per minute. The KC-10A can be air-refueled by a KC-135 or another KC-10A to expand its delivery range. The KC-10A fleet is being modified to add wing-mounted pods to further enhance aerial refueling capabilities. They are operated by the 305th Air Mobility Wing, McGuire AFB, NJ, and the 60th Air Mobility Wing, Travis AFB, CA. Page rendered on 25 April 2019 at 01:19:09 in 355.005 microseconds.